← Fixed Duration, actual work, remaining work – how are they linked in MS PROJECT 2013? 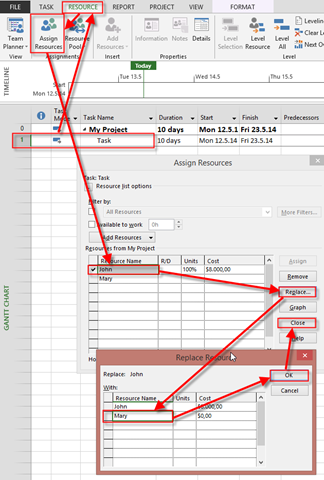 How to replace Resource for the partial completed Tasks in MS PROJECT 2013? Everything is perfect. John has work assigned only at first week, and has actual work, and Mary has assigned work for Second week. The answer is:” Yes, be careful with John!” Or Use custom field with status, whatever, but do not erase him! This entry was posted in MICROSOFT PROJECT, Microsoft PRoject 2010, Microsoft Project 2013, MS PROJECT 2010, PMI, PRoject Management and tagged Microsoft Project 2013, Microsoft Project 2013 - Resources, Microsoft Project 2013 - Tasks, MS PROJECT, MS PROJECT 2010, MS PROJECT 2013. Bookmark the permalink. 2 Responses to How to replace Resource for the partial completed Tasks in MS PROJECT 2013? is it possible to remove the possibility of assigning john to task even by keeping hm in the resource sheet by changing his availability in john calender?